The term "chronic" in Chronic Lymphocytic Leukemia comes from the fact that it progresses more slowly that other types of leukemia. The term "lymphocytic" in Chronic Lymphocytic Leukemia means the cells are affected by the disease (group of white blood cells are called lymphocytes, which help the body to fight infection). Chronic Lymphocytic Leukemia (CLL) is a cancer of the blood as well as bone marrow. Bone marrow is a spongy tissue inside the bones where blood cells are produced. It usually affects lower adults. WHAT ARE THE SYMPTOMS OF CHRONIC LYMPHOCYTIC LEUKEMIA (CLL)? Pain in the upper left portion of the abdomen due to an enlarged spleen. WHAT ARE THE CAUSES OF CHRONIC LYMPHOCYTIC LEUKEMIA (CLL)? There is no known cause of CLL but some researchers believe that there is a genetic mutation in the DNA of cells that produces blood. As a result of this mutation, the blood cells produce abnormal as well as ineffective lymphocytes. Further, these abnormal lymphocytes continue to live and multiply, when normal lymphocytes would die. These abnormal lymphocytes accumulate in the blood and certain organs where they can cause various complications. They may crowd healthy cells and interfere with the normal blood cell production. Various blood tests such as counting the number of cells in a blood sample, determining the type of lymphocytes involved, analysing the lymphocytes for genetic abnormalities, bone marrow biopsy and aspiration, various imaging tests such as CT and PET tomography. Treatment for Chronic Lymphocytic Leukemia depend on several factors such as the stage of the cancer. According to modern medicine, treatment may not be necessary in the early stages. If the physician determines that the chronic lymphocytic leukemia then the treatment is recommended. The treatment includes chemotherapy, targeted drug therapy, immunotherapy and bone marrow transplant. In Ayurveda, various etiological factors and pathogenesis of cancer including blood cancer have been mentioned. The management of pathya-apathya arbuda is also found in Ayurveda. 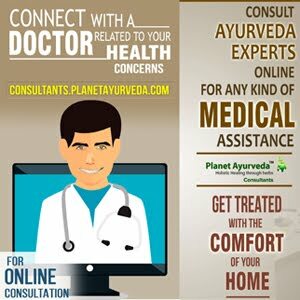 The various herbal, polyherbal, minerals and herbo-minerals drugs are suggested for Rakta Arbuda in Ayurveda. According to Vagbhat, the vitiated Dosha will constrict and compress the blood within the siras (venous). The obstruction of blood produces lump of mamsa which is covered with muscular sprouts and grow very fast along with bleeding. This vitiated blood along with the circulating blood within the vessels produces leukemia. This condition makes the patients suffer from anaemia and other complications. Planet Ayurveda offers Crab Care Pack for the treatment of Chronic Lymphocytic Leukemia. Ashwagandha Capsules of Planet Ayurveda are prepared from the standardised extracts of the herb Withania somnifera. These capsules are packed with the anti-oxidant properties which help to boost the immune system. This herb is loaded with the anti-cancerous properties. These properties help to slow down the growth of cancerous cells and also enhances the growth of healthy cells. It is also considered as the nervine tonic. Thus, it helps to pacify the nervous system as well. Dose: 1-2 capsules twice daily. Guggul Capsules by Planet Ayurveda are the standardised extract of the herb Commiphora mukul. It balances all the three doshas in the body like Vata, Pitta and Kapha. These capsules help in improving the immunity of the body. This herb has anti-oxidant properties as well. Moreover, it can be taken for quite a long period of time, ranging from few weeks to months. It improves digestion, improves strength and considered as a tonic. It heals wounds quickly and considered as an excellent anti-inflammatory herb. It relieves tumors, growth and wart. Due to its sweetness, it balances Vata, due to its astringent properties, it balances Pitta dosha and due to its bitter properties, it balances kapha dosha. 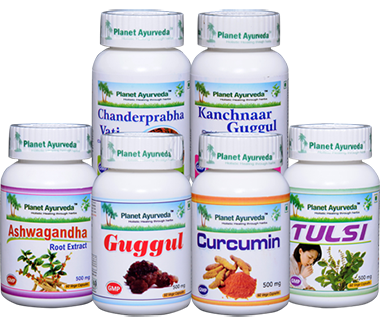 The Ayurvedic formulation Curcumin Capsules by Planet Ayurveda is a 100% pure product prepared from the standardised extract of Curcumin. It is a common spice in India used in daily meals. Owing to its rich medicinal properties, curcumin is widely used in cancer. Many malignant cancers can be cured by curcumin. The anti-oxidants present in curcumin reduce the free radicals from the body thereby improving the health as well as immunity. Tulsi Capsules by Planet Ayurveda are prepared from the standardised extract of the herb Ocimum sanctum. It is considered as an immunity enhancer therefore this herb is used in the cancer of all types. This plant is richly endowed with bioavailable anti-oxidants, Vitamin A, Vitamin C and calcium. Chanderprabha Vati is a classical Ayurvedic formulation used in the Ayurvedic treatment of various disorders such as diabetes, diseases of the urinary tract, urinary calculi, tumor, fibroid, cancer, low back ache, low digestion strength, anorexia, lack of interest in food and various other disorders. It acts as a catalyst for other herbal ingredients to deliver swift therapeutic action. It also acts as an anti-aging and rejuvenative. Dose: 1-2 tablets twice daily. Kachnaar Guggul is found effective in the blockages of lymphatic channels, inflammation of the lymph nodes, tumors of all kinds especially Hodgkin's lymphoma and other types of benign as well as malignant tumors. It is also useful in ovarian cysts, uterine fibroids, goitre etc.